Alan Friedman is not a professional astronomer. 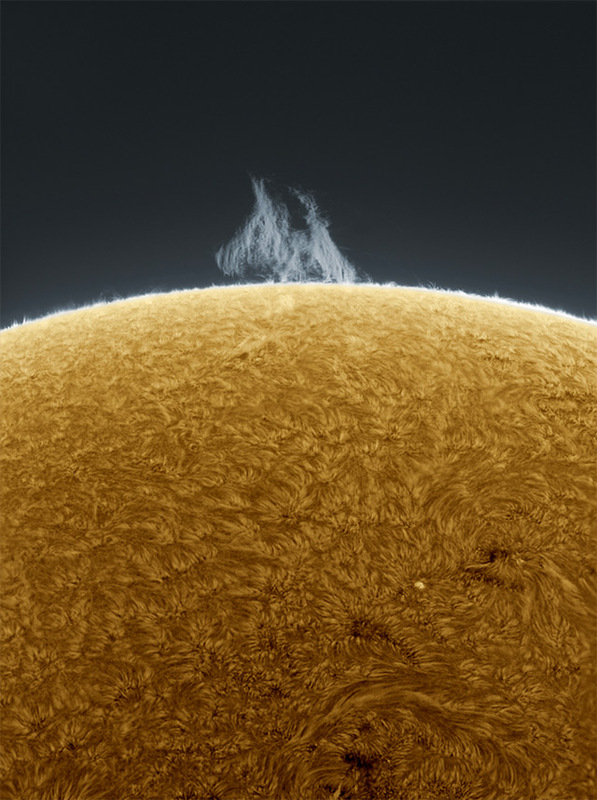 A greeting card publisher by day, he spends much of his spare time on his passion – photographing the solar system from his backyard in Buffalo. 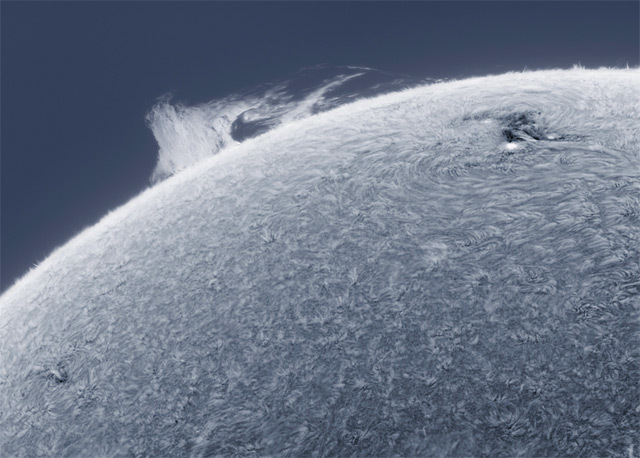 What he manages to accomplish with his home based observatory is amazing. His astro-photography is accomplished at a disadvantage as the city’s bright light limits what he can capture to the bright objects of the sky – the sun, moon, planets and bright stars. He explains, “The raw material for my work is black and white and often blurry. As I prepare the pictures, color is applied and tonality is adjusted to better render the features. It is photojournalism of a sort. The portraits are real, not painted. 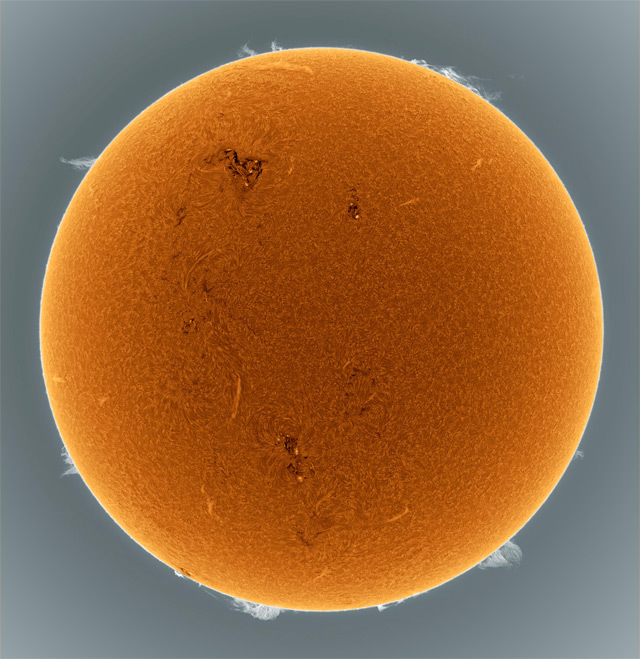 Aesthetic decisions are made with respect for accuracy as well as for the power of the image.” The hours and hours he spends is worth the time as his images depict the sun in a highly artistic yet accurate manner. Check out his latest work on his Tumblr blog. His prints can also be purchased at Photoeye. He has also given a TED presentation where he talks about his work and inspires others to try doing something similar! 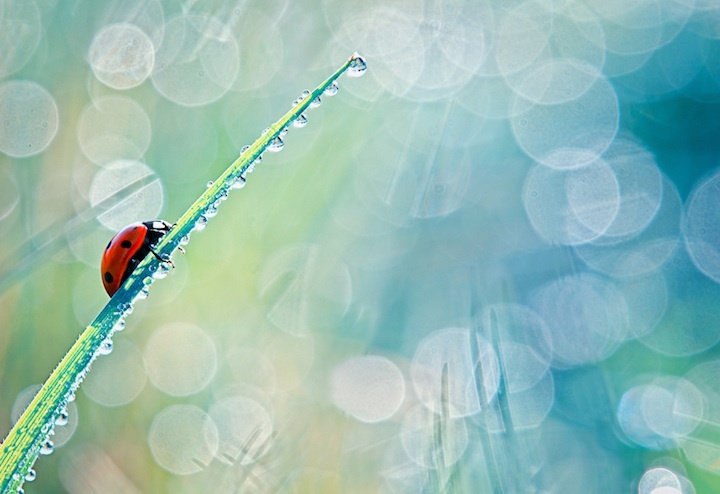 Spanish photographer, Bloas Maven, has a special affinity for ladybugs. 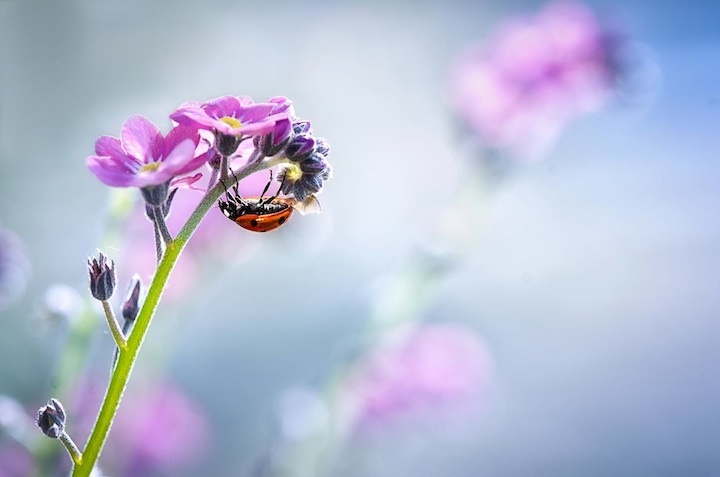 He took up the challenge of photographing these tiny insects in their natural environment as they climb up plants. 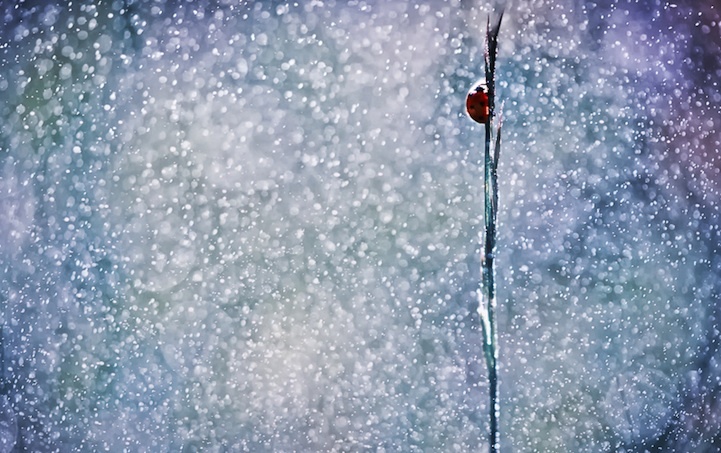 His photographic images are all the more beautiful because he captures the ladybugs against bokeh backgrounds. The end result is an artistic interpretation of the natural world of the ladybugs. Maven is relatively new to photography having bought his dSLR camera only a few short years ago. Yet, he clearly demonstrates an uncanny eye for just the right subject in the right place. Check out more of his macro photography here. Dillon Marsh is a South African landscape photographer who captures fascinating photographs of his native land. 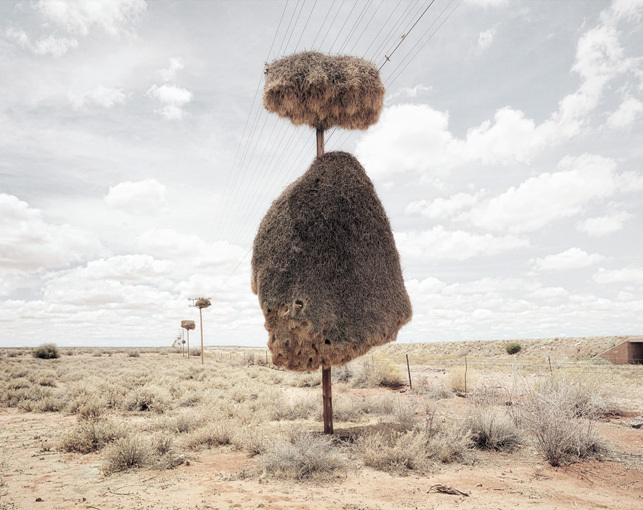 His “Assimilation” collection is a series of astonishing pictures of the enormous nests of social weaver birds. 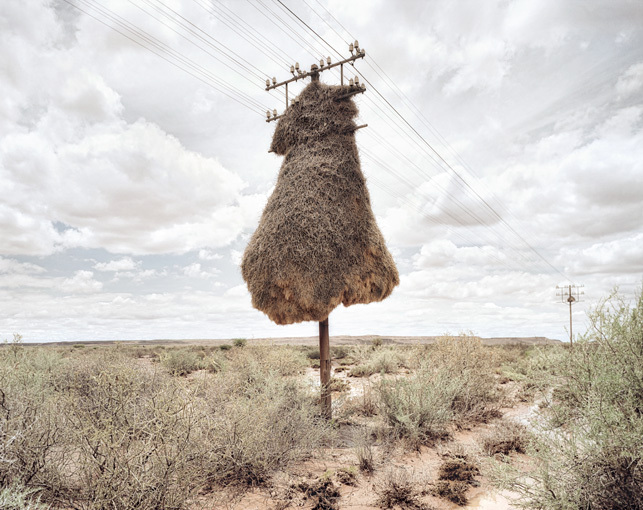 Over the course of 3 days, Marsh traveled through part of the southern Kalahari Desert alone and by car looking for these magnificent natural sculptures built on telephone poles. He relied on word of mouth to actually find the nests. The birds would continue to build the nests even after large chunks drop off due to the excessive weight! Only a few birds appear in the pictures as they were either inside or out and about. 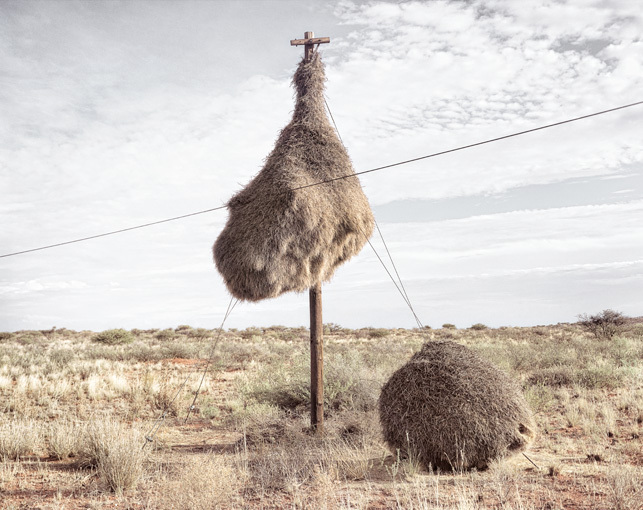 Marsh observed from his photographic findings, “The twigs and grass collected to build these nests combine to give strangely recognizable personalities to the otherwise inanimate poles.” A truly collaborative project between man and birds! 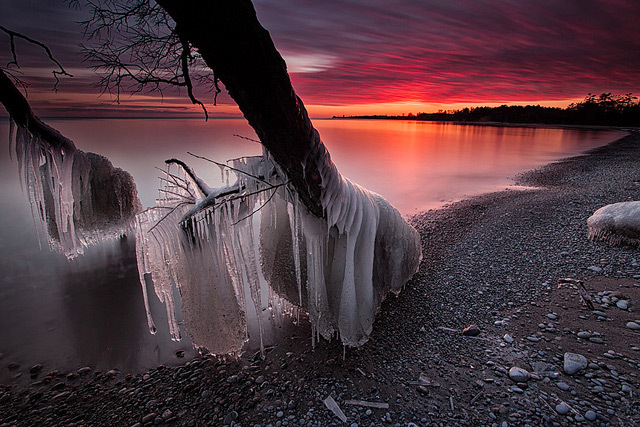 Timothy Corbin was born in Trinidad but now lives in Eastern Ontario, Canada. His passion for landscape photography in particular is evident in the name of his website – In plain sight. He believes the places worth taking pictures of are “right in front of us” and not necessarily exotic locations. 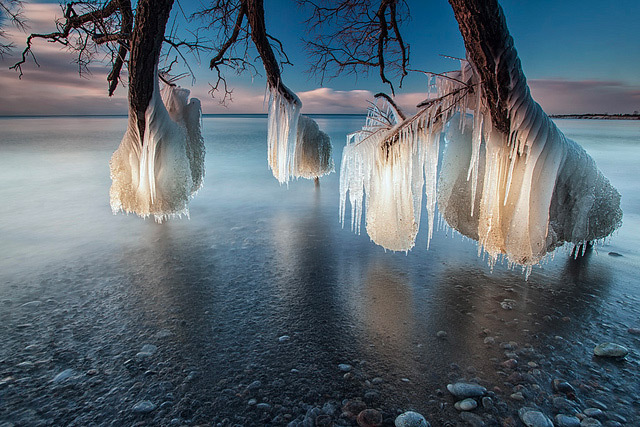 His striking pictures of frozen trees along the shores of Lake Ontario showcase his enormous talent for composition and light. 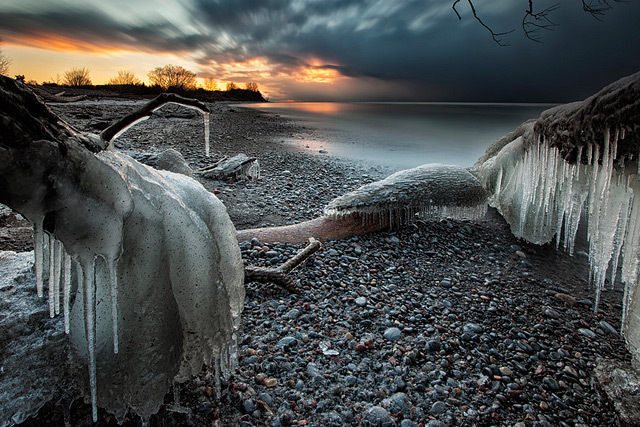 Wave action and the continual freezing created the -like formation on the trees. The starkness of the winter scenes contrasted with the lovely hues of the sky. 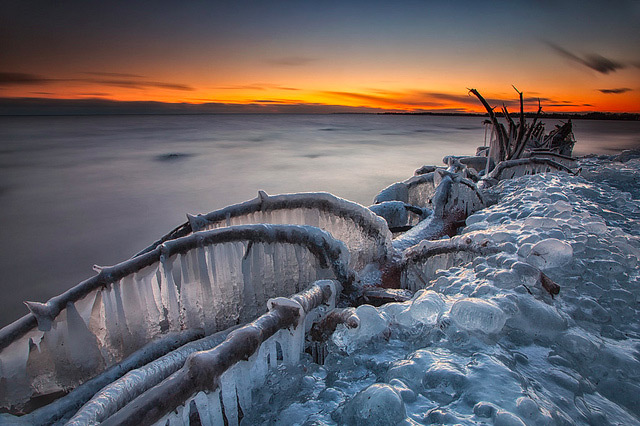 No wonder he called these pictures, “Fire and Ice” on Flickr. He is also interested in seascapes, cityscapes and cars!